I came across this and it needs to be said many times . 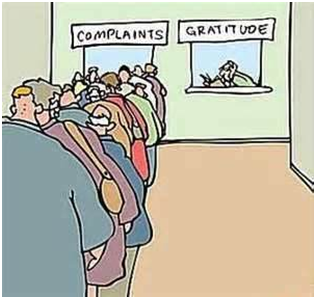 Unfortunately this is reality, we complain much faster than we give thanks. 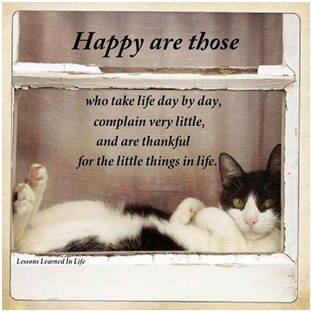 Make a point and find good things in your day and praise and compliment people straight away. Love the small things in life! for sharing my life with you! Have an awesomely grateful day, today! 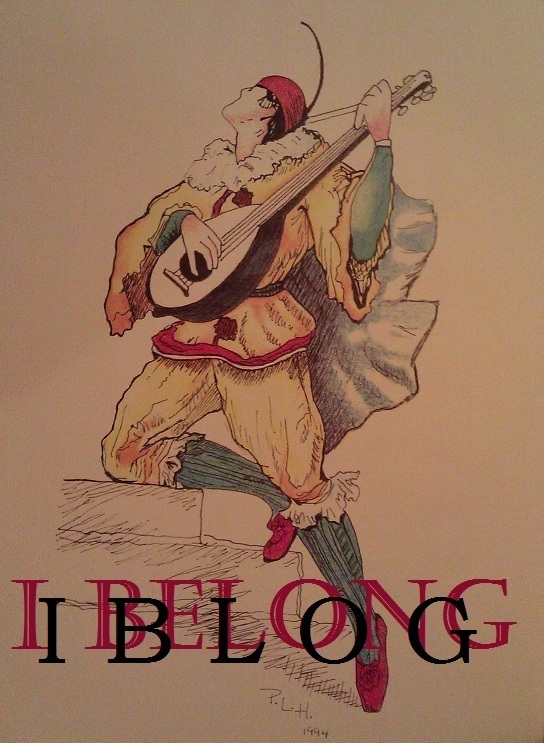 A good reminder, Ute. Thanks. 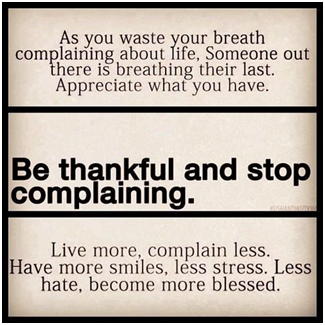 I am guilty of some complaining from time to time , but I do try not to do it. It is just sad that people complain much faster than praising people for good things! Thanks Andrea and a lovely day for you! I’m grateful that you are in my life, Ute. Your spirit shines like a beacon and warms my heart. Thank you for the excellent reminders in this post. Good timing for me – have just had the worst argument with my son that we’ve ever had. Thanks, Ute. Excellent reminder, Ute 🙂 Thank you! What a great bunch of inspirational messages. Thank you for sharing them with us. I went into a supermarket a couple of years ago (Tesco) and after chatting to an employee (Robyn – I still remember her) I went to the Customer Services desk and asked if I could have a form where I put a comment about one of the staff, and I was given a complaints form. I said that it wasn’t a complaint, I was extremely happy with the treatment I received. They had to search for a form, and in the end had to scribble things out of the complaints one as they didn’t have any positivity forms. Robyn had gone out of her way to help me with advice, and her personality was so outgoing and happy. I did go and tell what I had done, and her response was her saying that I didn’t have to do that as she was just happy enough to do her job and help. Some people are genuinely helpful. I wish more people were like that. I would put you down in that category Ute. You would go out of your way to help anyone. Dear Ute…..I am especially thankful for our friendship. The time we have spent together caring for each other’s souls has blessed me greatly. You are a dear friend that I cherish. I love the thought of appreciating each breath for someone is breathing their last. It is a good picture to give our children who think they are invincible. Each day, I am aware of the precarious nature of life because my dad was taken quite suddenly in a car accident. Life changed in an instant. You just never know what could happen.
! Love you, Sweetie….thank you for this reminder as I start a new day. Skye, love your words and do treasure our friendship. As you start a new day ours is almost finished and I go to bed with thoughts of what a wonderful day I had, and wake up tomorrow thankful to have another day to make great with God’s help. Thank you, glad you liked it. I am glad and grateful I can see all these great birds and wildlife on your blog, which I would otherwise never in my life. Big thanks to you! I know you do and I know you cherish and love every smile you get from Al and the time with him together, even if it is hard for you! Keep your strength! You are wonderful! 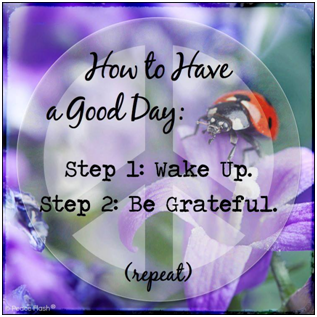 Two steps: wake up and be grateful. And I want to add ASAP…. always say a prayer. Thank you, Ute. Seeker, being grateful and saying thanks to God for what he gives us is important every day, I agree! another great reminder to all of us…i was down in the dumps this morning…this was like a good smack in the face that I needed….thank you my friend. I hope it wasn’t too hard a smack, but if it shook you up a bit, it is good, when it helped. Have a big hug and enjoy what life has to offer! Wonderful to hear, and you sound fantastic. Enjoy your day and make it another terrific day Renee! Will do Renee, thank you :-)! I try to be positive. But – some complaints are not easy to push aside. RoSy, You are great having more to be thankful for than to complain about. I agree with you that those migraines are definitely worth complaining about as they are not easy to live with. I wish you a migraine free day, month, year….. Really do RoSy! Rynna, you love your work and working with the children, they love you and you are so important to them. Have a grateful day today! Wow, hard work, but remember what a great start you give the little ones! I am grateful for my family, without them I would have lost my life…they helped me take it back with the knowledge it’s a gift not to be taken for granted. Thank you, my friend for a wonderfully awesome cyber hug of faith today. 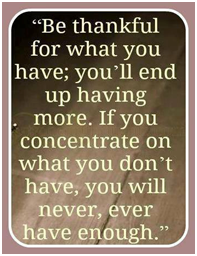 As you say there are many things we take for granted and it is good to be thankful for them. Fantastic you see this gift every day! Another tight hug of freindship for you! Thank you for you sweet comment and wishing you great weekend! 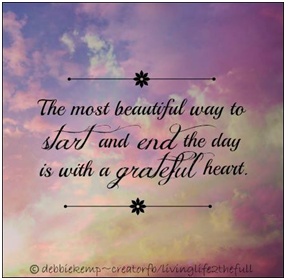 Yes, we are grateful for the sharing of all these lovely reminders! Thanks so much for being here and commenting. Wishing you a great Sunday too! Every now and again we have to make a decision whether to be around negative people or like minded positive people. It is hard, to separate from negative minds, especially if you have known them for a while, but life is much better to live a life of gratitude than complain and criticise. Hope that makes sense, Ute. Love your quotes. [ Smiles ] Very uplifting, Ute! Thank you Melanie, for visiting and commenting. Have a love filled day! I love the simple wisdom in each of the sayings. Very true they are yes. Thank you Dilip! I love the simple wisdom in each of the quote.